Here are your GravyGrowth quotes from various blog posts. I’ve put them into graphics for you to enjoy and to share. Be sure to leave a comment at the bottom and tell me what you think. Your feedback helps me to deliver what YOU are looking for! Even if you decide to work for someone else vs. launching a business startup, you’re career will stagnate if you don’t take risks. You may end up getting laid-off during a down-turn. Employers don’t want employees who are unwilling to achieve. 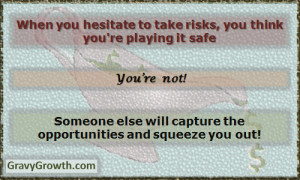 Achievements require risk. Sometimes you’ll find a better solution, or you may discover a better plan. 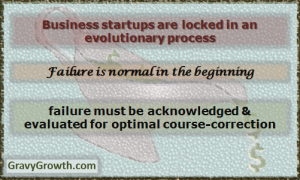 Use a formal process to test your new idea. Then formally amend your existing business plan. 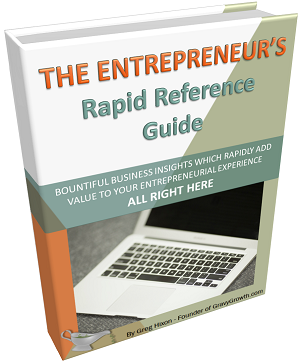 Business plan changes should be the exception – changes must be resisted. 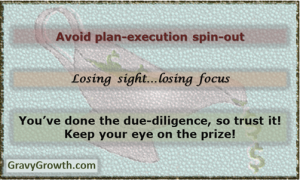 Avoid plan-execution-spin-out, which is my fancy term for losing sight – losing your focus – being distracted by new ideas. Keep your eye on the ball! You’ve done your due-diligence already, so trust it, and stay focused. 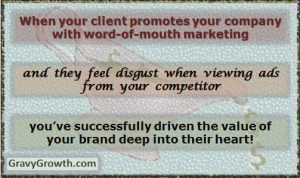 For small business, when you don’t have brand recognition, you are easily forgotten. You don’t have customer loyalty yet. Deliver stellar customer service that goes above and beyond what is expected. Do this with a carefully calculated, strategic approach. Then you will begin to build customer loyalty. Please visit my GravyGrowth Pinterest page to see more of these quote pictures. Thanks for check this out. Please share your favorite GravyGrowth quotes forward!